Yay!! 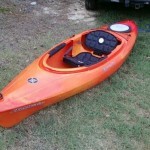 I got my new kayak and I am so excited. I’ve had a kayak for a couple of years now (check out my “Hobbies” page). Anyway, the old one is considered a touring boat. That means it’s long and narrow and used for longer trips- usually cuts through the water a little easier. On the other hand, it’s hard to carry and not as stable as some of the wider boats. After a suggestion from my Dad (he made it over and over), I decided to sell the old one and buy a new one. I researched for a crazy amount of time. I’m so particular when I buy something that is expensive. I also want to find the one I’ll be happiest with once I’ve made the purchase. First, I checked out the Old Town Vapor. Rented it, tested it out…thought I was convinenced to go with that model. Then, after a trip to REI, I was introduced to the Perception Prodigy. Love at first sight. No hesitation. I ordered it online and waited with anticipation. It finally came in and I took it out for it’s maiden voyage on 7/7/11. It was everything I had hoped it would be. You can expect me to post lots of pictures from future trips. I’m so happy! Ok, so most of my friends and family know that I love to geocache. Wait…I take that back. Most of them know I enjoy it but only a few actually understand the hobby. Anyway, I’m going on vacation next week and have already planned several “cache runs”. I’m hoping to visit Cane Creek Park to hide a few caches myself. Of course you know I’ll have to kayak there too. So…why not combine the two? PERFECT!! 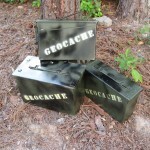 I’ve added a picture of the new cache containers that I painted today. Wow, I can’t wait for Friday to get here!